September 3, 2009  As a two-year drought drags on, water is now so limited for agriculture that Iraq imports 80 percent of the food Iraqis eat. That means during the holy month of Ramadan, traditional foods that came from Iraqi farms are getting harder to find. August 29, 2009  Prime Minister Nouri al-Maliki owes his job to the Shiite vote in Iraq, but he has stayed away from a new Shiite political coalition and may go it alone in January elections. But he risks splitting the Shiite vote, nor is it clear that Iraqis are ready to vote across sectarian lines. August 28, 2009  Most Iraqis are anticipating the withdrawal of U.S. troops, scheduled by the end of 2011. But many Iraqi businesswomen fear it will be a setback for the gains they have made during wartime. Since 2005, women-owned firms have earned millions of dollars from Pentagon-financed projects. August 25, 2009  A dramatic announcement is signaling a new and uncharted era for Iraq's election process. The Shiite Muslim coalition that has ruled Iraq since 2005 is breaking apart. A new political alliance, with a new name, is stepping forward. The coalition of parties includes secularists, women and some Sunni Muslim politicians. August 19, 2009  A wave of explosions near government buildings and commercial centers in Baghdad killed at least 95 people and wounded 500 others. It was the deadliest day in Baghdad since U.S. troops handed over security at the end of June. August 17, 2009  More than six weeks after U.S. soldiers withdrew from Iraqi cities, Gen. Ray Odierno, the top American commander, wants to put U.S. troops in disputed parts of northern Iraq. Political tension between Iraq's Arabs and ethnic Kurds has resulted in a security gap in the north that militants have exploited. August 16, 2009  Iraq's prime minister has said he wants the government to register Internet sites and ban some books. This has raised fears that the door may be closing on what has been one of the most open media landscapes in the Middle East. On Friday, Iraqi journalists, writers and booksellers took to the streets of Baghdad to protest. August 13, 2009  In recent weeks, the death toll from political violence has been rising — a reversal of July trends — undermining public confidence in security after U.S. troops withdrew from Iraqi cities at the end of June. 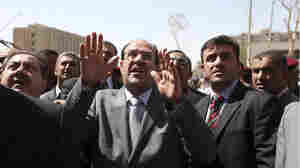 The bombings have been fodder for Iraqi wrangling ahead of the January elections. August 10, 2009  Life is better for many Iraqis, but bombings, ethnic tensions and corruption continue. NPR's Deborah Amos recently returned to the Iraqi capital on assignment and shares her impressions four years after her last visit. The unanswered question: what will happen when U.S. troops leave in 2011? June 24, 2009  Syria's border with Iraq has long been a line of tension. The U.S. and the Iraqi government have accused Syria of allowing foreign fighters to cross into Iraq. But these days, the border is a potential business asset, as Syria looks to Iraq to help improve its economy. June 22, 2009  The Iraqi refugee crisis has been out of the headlines for awhile. But few of the more than two million people who fled the country have gone back. Aid agencies are looking for new ways to find money to support the refugees who are mostly living in Jordan and Syria. June 19, 2009  Egypt is taking a more aggressive role in stopping the flow of arms smuggled into the Gaza Strip and destined for Hamas, the militant Palestinian group that controls the territory. But the smugglers' tunnels are also an important funnel for food and other supplies, and halting the trade is difficult.